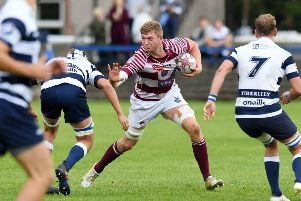 Two of the country’s leading stand-offs at club level will face each other in tomorrow’s Tennent’s Premiership clash as Watsonians face Currie Chieftains at Myreside (3.00pm). Lee Millar has shown his mettle and reliability with the boot under pressure for Sonians, as well as being an effective organiser on the pitch. His Chieftains counterpart is Gregor Hunter, who was the matchwinner in last week’s nail-biter against Heriot’s. Like Millar, he can bring his experience as a professional to bear. The former Gala colleagues are equally adept at unleashing the pace both teams have behind the scrum. Millar is second in the points scoring charts, just behind Ross Jones of Heriot’s and 13 points ahead of Hunter, whose half-back partner will be Roan Frostwick with Charlie Shiel not released by Edinburgh. Watsonians coach Steve Lawrie is eyeing victory and with it a step towards securing a top-four finish. Cairns is relishing the clash, saying: “The big matches just keep coming and we are looking forward to the challenge that Watsonians will present. Across Colinton Road, Boroughmuir welcome Stirling County in a mid-table clash between two of the teams awarded Super 6 franchise for next season. Muir’s only change sees Tom Drennan replace Callum Atkinson at lock. Heriot’s, who are fourth, travel to second-placed Melrose with the critical words of coach Phil Smith ringing in their ears. He was troubled by the lack of a cutting edge in attack last week. Heriot’s have been boosted by the return from injury of Jason Hill. Having posted a first win of the season at home to Hawick last week, Edinburgh Accies face another fellow struggler in Glasgow Hawks. A win for the hosts will guarantee they will avoid finishing bottom, while Accies need to repeat their win of last week.